Having a WordPress website with all the essential functionalities is great! But if you are into business and really want to make it big with your customers, all you need are WordPress forms. Be it a list builder form, a contact form or a survey form..they are an integral part of any website design. Having a professional looking form makes it easier for your website visitors to reach out to you. It is an effective channel of communication that can bring you business opportunities, leads, blog subscribers, potential customers, etc. The possibilities are endless. Upload button – Allow users upload a document, image, etc. Limited fields -Keep only necessary input fields. Having irrelevant fields and questions on a form can frustrate your prospective clients. Primary Purpose – Resolve customer queries or concerns. The contact form is one of the most common types of web forms. Almost all the sites on the internet have a contact form for their visitors and they should. 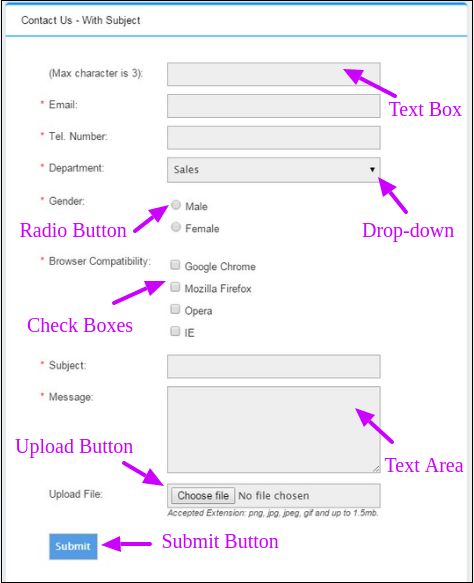 Most contact forms have three input fields: Name, Email and Message. Some sites may have additional input fields based on the requirements and type of website. Some may even show an acknowledgment message to confirm that the message is sent. The contact form is also a safe way to receive emails. The messages are directed to your inbox, but you do not need to publicly display your email to the visitors. Thus, this helps in fighting spam as your email address is hidden. 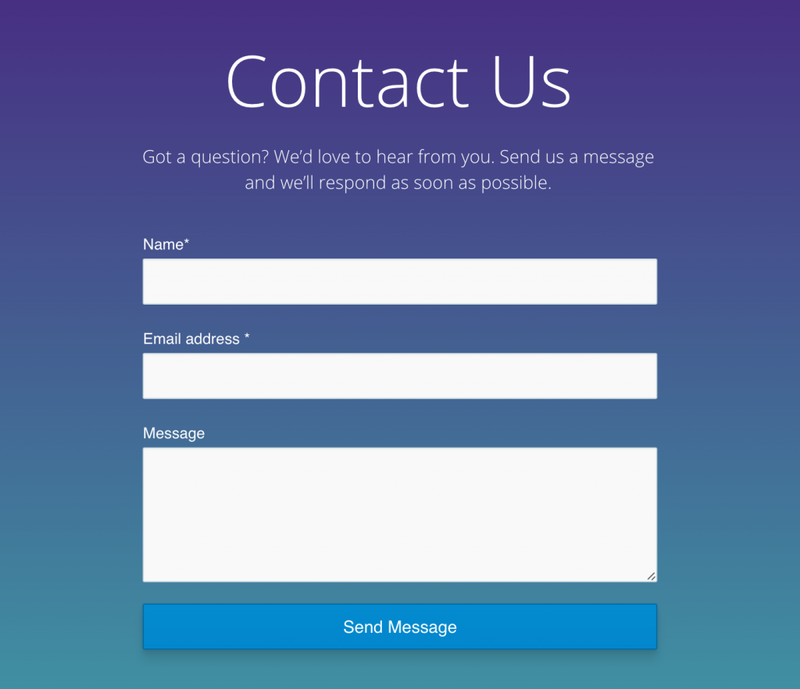 Another advantage of a contact form -The user can quickly fill the form fields and press send. It avoids all hassles of copying the email id from the website, and then composing a new email using an email client like Gmail, Yahoo, Hotmail, etc. Primary Purpose – Gather feedback and data about your potential customers. For market research or to validate a product idea. By bloggers and marketers to gather feedback about their content and website design. As a pop-up or a dedicated web page. Primary Purpose – Capture the email leads and convert a casual visitor into a lead for your business. Almost all the modern blogs have an opt-in form that collects leads. Social media updates might get missed or ignored, but an email will definitely land in front of your potential client. This is why all the business gurus suggest converting your social media fans into email subscribers. By entering an email in the lead generation form, the website visitor grants you the permission to send him email updates regularly. Lead generation forms are also used on landing pages where lead magnets are used to get the emails of the potential clients. Tutorials, freebies, offers, etc. are attractive baits to encourage users sign-up. Primary Purpose – Sell services or products. If you run an e-commerce website or a SaaS (Software as a Service) business, an order form will help your users place their orders and proceed to checkout. The order forms can also have an integrated payment option such as PayPal, debit cards, credit cards, etc. An order form may have elements such as credit card details, coupon code, ‘Buy Now’ button, etc. If you are organising an event, a conference or a meeting, you can avoid the hassles of maintaining a physical log book by placing an event registration form on your website. 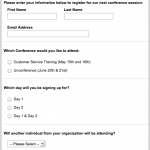 The form will automatically maintain records of attendees and collect payments. Some of your email subscribers might want to opt-out from receiving any future emails. Or if you are a service-based business which regularly sends emails to their leads, you might want to create an unsubscribe page on your website. The unsubscribe forms will let the disinterested users or subscribers to opt-out from future email updates, promotions, or announcements. Although no one want to place an unsubscribe form, you can’t force visitors to be your subscribers forever. How to Create WordPress Forms – Coding or Plugins? I guess, you are now clear on which type of form to use in a particular case. Now let’s look at form creation. But hiring a professional web developer might cost you money. So why invest in hiring a developer or code forms yourself when you can use WordPress plugins to build professional looking web forms in minutes without tweaking a single line of code? Plenty of WordPress form builders and plugins are available. All of them have the same elements like text input, buttons, drop-down menus, etc. Only difference is the customisation options. Plugins can help you build forms without the help of a programmer. You can change or modify the style of a form anytime. Thus, it is economical. The plugins allow you to design the forms that match the theme of your website. You can customize the colors, shapes, etc. 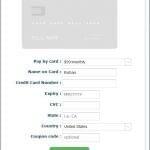 The plugins provide a user-friendly interface to customize a form. So, no coding hassles! The WordPress forms created using plugins are easy to customize so they can be used for various purposes like contact forms, subscriptions forms, newsletter forms, email forms, signup forms, etc. There are a variety of WordPress form plugins available in the WordPress marketplace. Here we picked one of the best ones available on WordPress repository. Some have advanced features too. Contact Form 7 is the most popular WordPress form creation plugin. After activation, a ready-made contact form is automatically added to your website and can be inserted into whichever page you’d like it. Ninja Forms is also a free WordPress form creation plugin with some pro features. It provides a drag and drop interface for beginners and customizable options for developers. Installation on multiple sites is possible. Easy for beginners since it offers drag and drop functionality. The extensions available for the plugin must be purchased separately. Does not support A/B testing. Editing form HTML is not possible. Rainmaker is the easiest WordPress form and list building plugin. Icegram Rainmaker plugin offers ready-made high converting opt-in forms that can be displayed anywhere on your website using the shortcode. No CAPTCHA option, but it can be resolved using EBcaptcha. Formidable Forms is a WordPress form plugin that creates stylish WordPress forms. It allows creating posts, tables, and graphs using collected data. Pirate Forms also joins the list of WordPress plugins having an easy user interface and creating simple forms. No advanced functionality such as subscription forms, payment integrations, and others. Ask for relevant information and make it quick. Complicated forms might discourage visitors from filling it. The form should have clear labels and description. Your CTA should inspire your website visitors to take action. Simple form design coupled with a click-worthy CTA is a recipe for lead generation success. Use power words like free, instant, discount, massive, best-selling, etc. You can employ the psychological persuasion tactic called scarcity to move your visitors to action. We are more likely to value opportunities that appear scarce and limited. Consider the example above; the count-down timer pushes the visitors to enter their name and email. The button on the forms must stand out. There is no best color as such. But prefer selecting solid bold colours rather than gradient shades. Hover animations may also contribute to increased clicks. Placement of forms will affect your conversion rates. For example, subscription forms that are displayed above the page fold might capture more leads than those displayed at the end of a blog post. You must test and find optimal place to embed and display the forms preferably above the page fold area of your website. Nothing converts better than having an authoritative figure or celebrity image on the forms as shown in the example above of an opt-in form from Robin Sharma’s official website. 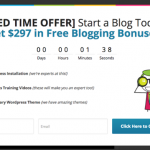 This is another psychological tactic which you can use to increase your conversion rates. We tend to associate popular and known figures with trust, credibility and success. It is proven that pop ups forms are best for conversion. Visual Website Optimizer increased their sign ups by 50% using popup forms. Why do popup forms work? When a popup is displayed only the form is highlighted and the background is blurred or darkened. Minimum required fields = increased form completion rates. Also today, Yes-No CTA popups are the hot talk of the town. 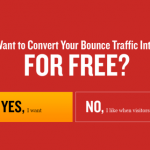 Read more about why Yes-No popups convert so well. How to create ceautiful high-converting popups within minutes? Icegram is one of the most powerful WordPress plugin to grow subscribers and increase conversions. Icegram offers beautiful, attention grabbing, and well timed popups that can skyrocket your conversion rates. Using Icegram plugin, you can easily create customized popups with text, images and background colors of your choice. The option for customization allows you to create popups that match your website theme. Okay, you have made the best form ever and collected leads. What to do next? You must nurture the subscribers and leads that you collect through your lead forms. Email marketing tools such as Email Subscribers is compatible with list building/form building plugins like Rainmaker that will make your email marketing efforts a breeze. Also, people that subscribe to this Rainmaker form will be saved in database. You can then send automatic blog post notifications to subscribers. Not just that, you can also send promotions offers, updates, etc. using Email Subscribers. Rainmaker also integrates with MailChimp, Aweber and other top email marketing services. Target visitors based on time, location or behavior. 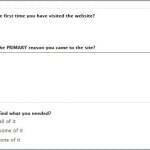 You may show forms or popup forms depending upon the time spent by the visitor on your website. Another way of targeting is showing forms on specific pages of your site. You can also set re-target rules for visitors who aren’t convinced in the first visit. A plugin like Icegram does the all the heavy-lighting for you once you have defined the targeting and re-targeting rules. All these efforts helps you increase your relationship with customers and get you more and more loyal customers. Bonus: How About Readymade Forms? 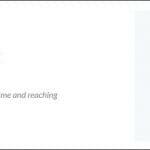 Icegram Rainmaker WordPress plugin is compatible with all the WordPress themes and plugins. It has beautiful readymade forms with easy customization options. It gives you the freedom to place forms anywhere on your website. You can integrate Rainmaker with MailChimp email marketing service. The data collected through Rainmaker can also be submitted to your own CRM. Rainmaker can be coupled with Icegram that offers high converting popups, action bars, overlay and calls to actions. Whether you’re a blogger, marketer or an e-store owner, Rainmaker can help you collect leads without any coding hassles. It saves tremendous time and effort in form creation. Within 5 minutes you can setup this conversion-boosting beast. The form is a communication medium that encourages visitors to take action initiating a communication loop. Using WordPress forms on your website is effortless using WordPress plugins providing high benefits and will remarkably improve your conversions and provide better user experience. We hope this guide helped you discover the potential of WordPress forms and the opportunities that it brings to you! I was planning to start a business site and was not sure, which one to choose, where to begin, because I’m a fresher in this field. And this post came across me like a magic. Thanks a lot for sharing this post and helping me getting into word press.. Thank you for the appreciation. Glad you found the post useful. Feel free to read other articles and contact us if you need any help. Wish you all the best.